Electric cars are steadily becoming pretty popular in the UK and it’s not hard to see why. They have lower road tax rates, they’re better for the environment, they can be ‘refueled’ at home and they’re significantly cheaper to run. There’s also the government’s plug-in car grant, which knocks off 35% of the value of brand new plug-in cars, up to a maximum £3,500 discount. This can really make buying and owning an EV a simple and sensible choice. Today we’re looking at which models will go the furthest on one single charge. All of these results are based on manufacturer figures show on their websites, so expect some changes in the real world as a result of different aspects such as outside temperatures, average speeds and how many passengers and cargo is in the car. Let’s get started. The Model X is just something else. Utterly outrageous, with its gullwing doors and mind-blowing performance figures. The Model-X is a car that can seat 7 people in extreme comfort and tranquillity for nearly 300 miles before demanding a plug socket, but it can also launch itself off the mark instantly, thanks to the monstrous amount of torque from the electric motors - although this will take a healthy chunk out of the achievable range though, naturally. So you’ll be happy to know that it takes just 30 minutes to top-up 170 miles worth of juice. The Model-X isn’t cheap though, with prices starting from £80,200 for the (slightly) more sensible 75D spec with that price rising to £91,750 once you’ve added the third row of seats and selected the autopilot functionality. The Model S really is the leader of the Electric Vehicle revolution. It might not have been the first mass-produced electric vehicle, but it’s certainly the best. Not only does it rub shoulders with the likes of Porsche, Mercedes and BMW when it comes to interior quality, it rivals (and in some ways surpasses) the likes of Ferrari, Aston Martin and Lamborghini. The Model S is also a really sensible family saloon. It’s expensive, yes, but for business owners and executives, the Model S is a really sustainable and responsible car to consider, particularly on a company car scheme. The manufacturer quotes an astronomical 424-mile range, however, the depends on controlled conditional, but in real life, you can squeeze a whole 335 miles of range from one charge. The Model S uses similar technology to the model X, so rapid charging up to 170 miles takes just 30 minutes from flat. The Model S is on sale now for £65,550 after the government incentives. Certainly not cheap but not exactly outrageous for this science-fiction-like package. The I-PACE is realistically one of the only viable alternatives to the Audi e-Tron for premium buyers. The two are in hot competition with one another, which means there is a lot at stake. Luckily, the British designed I-PACE is a real delight. Its looks are unique and appealing, the acceleration is swift, to say the least, just 4.5 seconds from 0-60 mph, and it’s got a great big boot too. What more can you ask for? Of course, the interior is exquisite, as you would expect from a Jaguar Land Rover product, and the onboard technology isn’t nearly as minimalistic as that of a Tesla. The cabin isn’t radically over-designed, it is just pleasingly luxurious and the dashboard shares a similar infrastructure to the fossil-fueled E-PACE. Priced from £60,995 inc the government's plug-in car grant. Another one from South Korea, only this time form Hyundai’s rival, KIA. The e-Niro is based on the fuel-powered Niro, only with an electric motor where the engine once sat and some light aesthetic alterations, mainly for aerodynamic purposes. So, that means the e-Niro is just as much of a loveable, joyful small SUV with bags of character, just like the regular Niro, It’s also a purpose-built family car with a sizeable boot and features that will appeal to parents and children alike. There is one area the e-Niro surpasses the Hyundai’s for certain, and that’s on the warranty. KIA provides a massive 7 years/ 100,000 miles warranty with all of their cars, which is the best on the market. The e-Niro is on sale now with prices starting from £32,995 after the government's plug-in car grant. 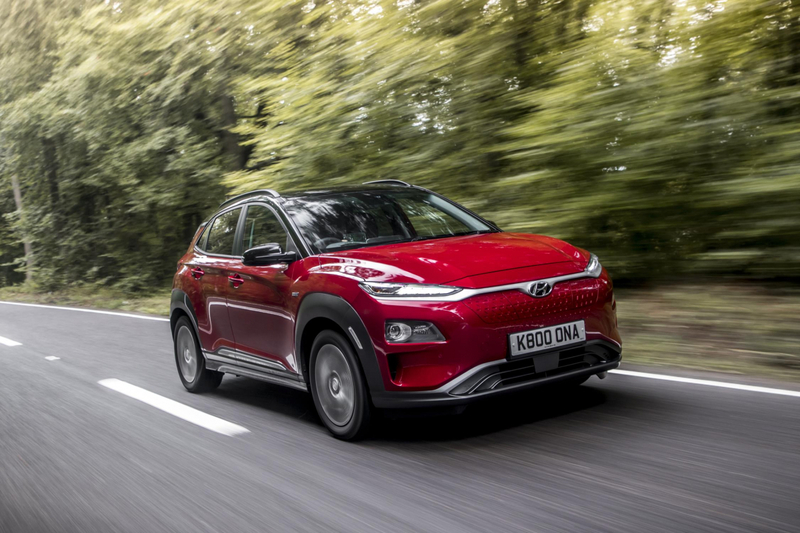 The Hyundai KONA Electric comes with a massive 279-mile range and it can charge up to 80% in a modest 75 minutes. Buyers will love that the KONA looks a bit more reserved than other EVs. It’s still eye-catching and modern, but it doesn’t look like it has been dragged off the set of the next Star Wars. The KONA electric is priced from £27,250 after the government grant, although, due to popular demand, there is a waiting list for this vehicle. It might start to feel like we’ve been going on about the e-Tron a bit too much recently, but we can’t help it, we simply adore it. The e-Tron, we think, is the most likely car to convert petrol and diesel buyers from the premium SUV market (which is massive) into electric SUV owners. Why? Because it looks like a normal Audi SUV, which means it’s aesthetic, desirable and classy. The e-Tron is also extremely well developed. Despite the fact it is one of the largest EVs on the market, it only takes half an hour to achieve 80% charge in a rapid charger, and 100% will conquer about 241 miles, according to the manufacturer. Not bad! Obviously, it’s not particularly cheap, prices start from £72,240 - which isn’t budget-friendly for most of us but it will stand out to a huge market of premium buyers. The Nissan Leaf was the first electric car to win World Car of The Year almost 10 years ago, and since then there’s been very few ‘EV’s even nominated for the prestigious award. In the meantime, the Leaf has just got better and better. The Leaf e+ is miles ahead of the competition in the small electric car market, miles. Rapid charging to 80% will take an hour and a half however this is offset by the fact the new model will return a superb 239 miles on one charge. The new model is also a pretty good looking thing, with beautiful angles and a contrasting coloured. The LEAF e+ is the number one selling electric car in Europe and it is on sale now from £27,995. Hyundai wasn’t going to sit on the sidelines of the electric revolution for too long, were they? Hyundai has earned their reputation as innovators with vehicle technology and the new IONIQ is nothing short of a tech fest. It’s one of the fastest charging electric cars on the market, as a rapid charger will get the IONIQ to 80% of its battery capacity in just 30 minutes. That’s exceptionally quick. A full 100% charge will provide 174 miles according to the manufacturer, which is more than enough for most people. The IONIQ is on sale for £27,250 after the government grant and because it’s a Hyundai it comes with 5 years of warranty and 5 years of annual health checks, free of charge. The e-Golf has been on sale for a while and is a really promising vehicle. It’s a great ‘first EV’ for people who are used to conventional cars because, well, this is a conventional car only with an electric motor. The regular Golf is a car that we could all get along with just fine, and so too is the e-Golf, with the added benefit of it being extremely affordable to own. The e-Golf is on sale now with prices starting from £29,740 and rapid charging to 80% takes just 45 minutes.